Here's how it works: At the beginning of each month, Murray's in-house cheesemongers go into their caves and taste EVERYTHING. Tasting is crucial because cheeses have a life of their own, as flavors and textures can change from month to month. 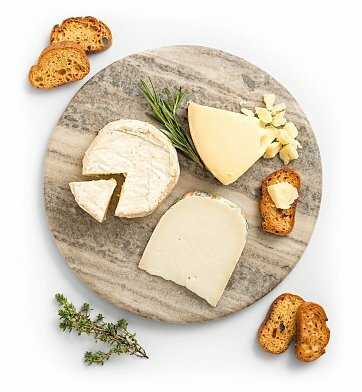 After sampling through the whole cave, they decide on the three most spectacular cheeses of the moment, and send those delicious superstars out to the lucky subscribers. Orders shipping on Monday for overnight (Tuesday) delivery must be received by 2:00 PM EST. For all Murray's Monthly Club orders placed through November 30th, the first shipment will arrive December 12. For all Cheese of the Month Club orders placed December 1 through December 31, the first shipment will arrive January 10. November 21, 22, 23, December 24, 25, 31 and January 1. Each item in this gift is securely wrapped and shipped with insulation and ice packs to safeguard the shipping process. Artisan Cheese of the Month Club is a hand delivered gift. These gifts are delivered by one of our local design centers located throughout the United States and Canada. Same day delivery is available for most gifts when ordered before the cutoff time. The cutoff time for Artisan Cheese of the Month Club is in the recipient's time zone. Treat someone special to a subscription of the best variety - cheese! Murray's cheeses are cut-to-order and wrapped in specialty paper. Gift contains food-safe ice packs to safeguard the shipping process.